Newly refinished to bring out the natural woods, this parson table has an extra leaf 23.5 inches wide to extend the table. The leaf matches perfectly. Designed by Milo Baughman in rosewood, walnut and teak. This round table has a bevelled oak top with plated steel legs. It was designed by Arne Jacobsen. Mix of rosewood, walnut and ash makes this table top stand out supported by four ebonized legs and two 20" leaves makes this table 112" long. 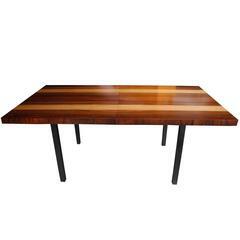 Vivid rosewood pattern large Danish modern rosewood dining banquet table with three 20" extension boards. Extends up to 105" long. Recovered oak big table designed by Anonymous in Barcelona Measures: 2.50 x 1.20 x 76 cm. There is the possibility of making it in different measures. Walnut Mid-Century Modern dining table with one leaf. Super Ellipse dining table with chromed steel legs. Designed by Piet Hein and Bruno Mathsson for Fritz Hansen, Denmark 1974 original label to underside.